The 158-acre Rome Conservation Area woodland sits on the Gardner’s northwest boundary with the town of Winchendon. This property marks an abrupt transition from high density development to an extensive stretch of undeveloped woodland and wetland that sit within the Wilder Brook and Bailey Brook watersheds. 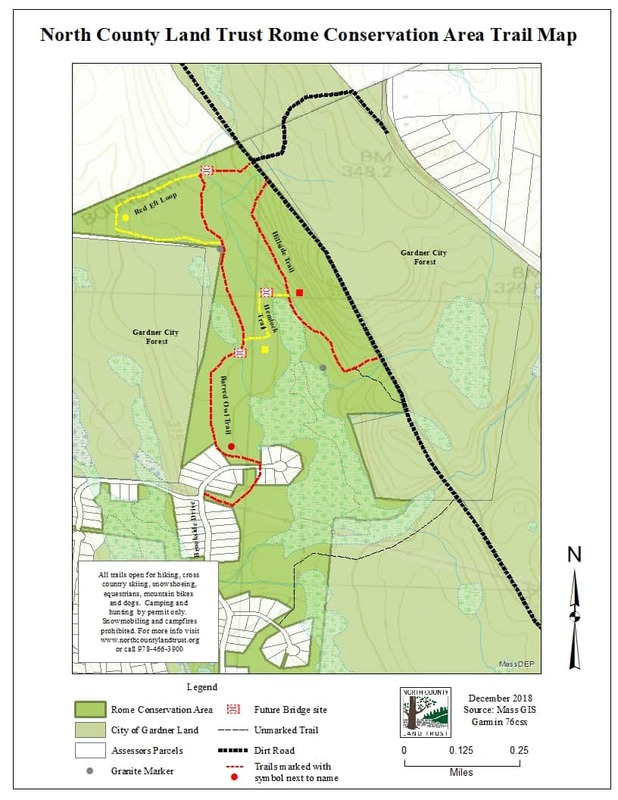 Trails on the Rome Conservation Area connect to woodland trails and dirt roads in Gardner City forest and in to Winchendon. Except for a small stretch of open powerline and occasional open water along Wilder Brook, this property is entirely forested with a mix of deciduous and evergreen species, most notably hemlock, spruce and balsam fir. This is close to the southern limit of balsam fir and it is interesting to note that pockets of this property near the entrance to the forest from the powerline can feel much colder than the surrounding area and snow will stay on the ground much longer! The Rome Conservation Area is a linear parcel of land stretching over a mile and a quarter north to south. Wilder Brook bisects the southern third of the property from east to west. The more accessible northern portion of the property is defined by a wide, red maple wetland system that drains from the north into Wilder Brook. Timber was harvested from the property in 2018 to improve the health of the forest and to encourage more tree diversity. Download the Rome Conservation Area PDF Map or see the online map below. There is no trail head parking area, but parking is allowed on the roadside.